But what if at the same time, recent data also show the United States experiencing strong economic growth? Price action of AUD/USD may be flat. One option that you have is to match the AUD against the currency of an economy that isn’t doing so well…. Let’s say you did some analysis, checked the BabyPips.com economic calendar (shameless plug!) and you notice that the Japanese economy isn’t doing so good right now. 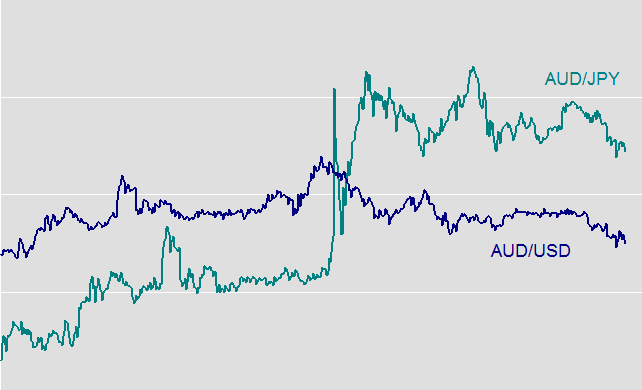 In the chart above, notice the relative strength of AUD/JPY vs. AUD/USD. You’re not limited to just these currency pairs, you could’ve compared AUD against like EUR, GBP, and CAD. From there, you can look for the weakest currency to trade against.